Settle into this spacious loft and enjoy the fresh air breeze and views of the sea allowing you to converse with the stars and listen to the breaking waves. 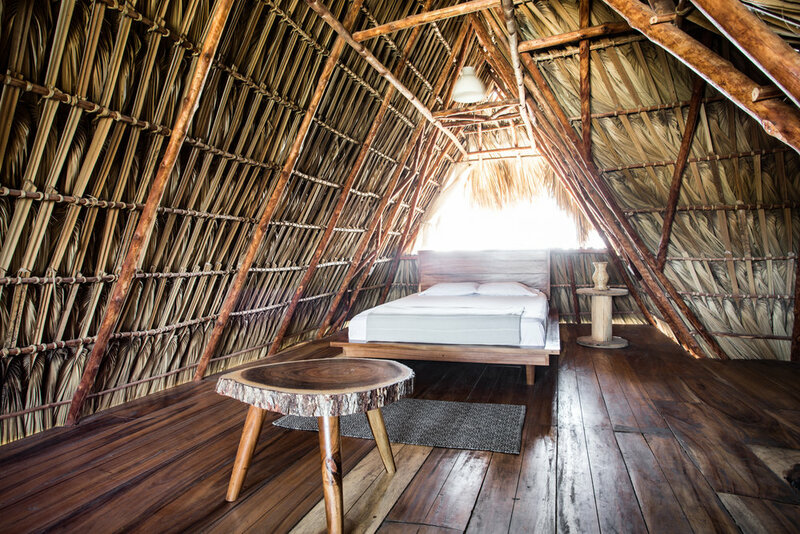 Lounge the day away on your cozy sofa nested in a local style thatch palm roof. To compliment this lovely space, enjoy the luxury of a private bathroom and tropical garden shower at ground level. *Please note that access to this room is via a steep staircase. Price: 2 Pers. @ 580Q + 100Q additional person. The biggest of our rooms, the Bungalow is designed over two levels and sleeps up to 5 people. The ground floor is made up of a first bedroom which opens directly to the front terrace surrounded by garden and greenery and a bathroom and tropical garden shower out back. Climb up to the second level and soak in the views of the sea to one direction, and the garden and not so distant volcanoes to the other direction. 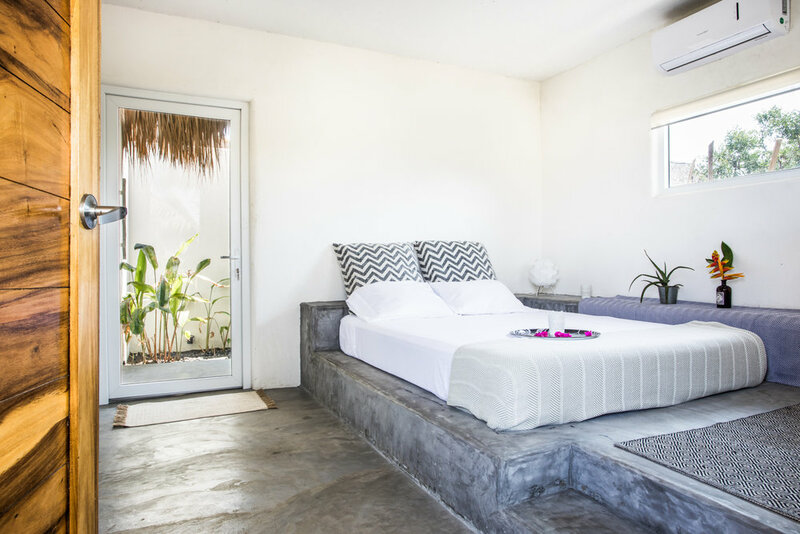 Nested under a traditional thatch palm roof, La Cabaña is a cute space ideal for couples or single travelers. This lovely space offers a beautiful view of our garden, made up of a variety of lemon trees, palm trees, and tropical flowers. Below, breath in the fresh air in your private nook surrounded by lemon trees. This room also includes a private bathroom and shower at ground level. 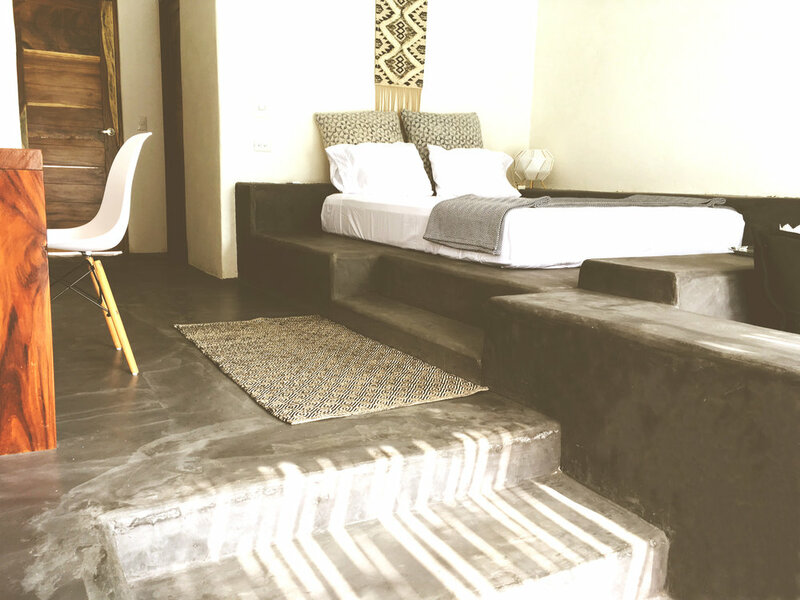 Settle into the Uluwatu suite and enjoy the comfort of an air conditioned space with a spacious desk and ample shelving to unpack all of your belongings. To the front, a private refuge of peace and tranquility on your sofa and lounge open towards the garden of tropical flowers and trees. To the back of the room, the light and greenery of the tropical garden shower flood in and brighten up the cozy space. Stay in style in your own poolside Swim-Up Suite - our most spacious and boho-chic accommodation. Equipped with A/C, a private indoor sofa lounge, private bathroom and garden shower - the real draw to this room is the terrace that gives directly onto the pool. Wake up and take a dip in the pool or enjoy a cup of coffee with your feet in the water. Important: Please note that there are no ATM’s in town, so it’s important that you withdraw cash before you arrive in El Paredon! A sales & tourism tax of 22% will be added to the total price listed. Cancellations 7 days or more prior to arrival date: a 15% Cancellation fee will be charged. Cancellations less than 7 days prior to arrival date: the first night stay will be charged in full. No-shows : the full amount of the reservation will be charged. Please be advised that we do not offer refunds for early departures. We require a two night minimum for reservations on Friday & Saturday evenings. Guests are welcome to check-in between 3:00pm and 9:00pm. If you plan on arriving late, please share your travel details with us so that we are ready to receive you. Any check In past 9:00pm -without notification from the guest- will be refused.